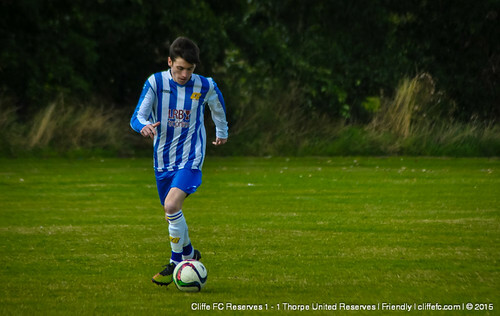 In the only Cliffe FC fixture over the bank holiday weekend, Cliffe FC Reserves play out a 1-1 draw with a Thorpe United Reserves side that will reside in the top division of the Reserve League, an encouraging result for Cliffe. From the kick-off the away side moved the ball around well and had the first chance, Thorpe’s Dave Hawe’s header going wide. Cliffe ‘keeper Dave Laverack was called upon to make a good save to keep the score-sheet blank. Cliffe had chances of their own with Nigel Horner nearly forcing a header into the net that needed a goalline clearance, and Layton Hallam hitting the crossbar with a long-range freekick. The score remained goalless at the break, 0-0 HT. The second half ebbed and flowed like the first as both sides looked evenly match, but Cliffe guilty of hitting a high long ball too often. Cliffe’s Andy Edwards fired a shot off the post that ricocheted off the woodwork and back off Edwards for a goal-kick. As the game entered the final 15 minutes, Cliffe did have the ball in the net, Kieran Dinsdale’s effort ruled out for offside however. Literally 90-seconds later though, Dinsdale broke through on-goal and scored the put Cliffe 1-0 ahead. Thorpe did equalise before the final-whistle, Adam Tessyman escaping the attention of Ryan Tiplady to fire a shot low into the net, the final score then reading 1-1. ***6th Sept – SUNDAYS begin season – vs. Thorpe H.
***Wed 9th Sept – U21s begin season – vs. Beeston. ***12th Sept – 1stXI begin season – vs. Easingwold A. ***12th Sept – RESERVES begin season – vs. F1 Racing H.
The New Inn Cliffe FC MOTM: Tom Hogg.